The Lower School was awash with amazing acrobats, stupendous strongmen and crazy clowns to name but a few of the marvellous characters on show during Circus Adventure Week. From Monday’s Greatest Showman inspired Assembly through to circus skills workshops with Circus Sensible and Drama workshops with Perform, the Lower School threw themselves wholeheartedly into a wide range of cross curricular activities. Year 4 were inspired by the story “Leon and The Place Between” and used their senses to write a circus themed story ending, while in Maths they tackled word problems that involved determining quantities of equipment needed for the circus acts and meal deals for circus snack sellers. Meanwhile, Year 3 uncovered the origins of the circus in Ancient Egypt and sharpened their multiplication and division skills through problem solving tasks. Year 5 tackled the controversial subject of use of animals in the circus which inspired some insightful debate on the subject of animal cruelty. In Year 2, our youngest children embraced the circus theme through English and Drama. 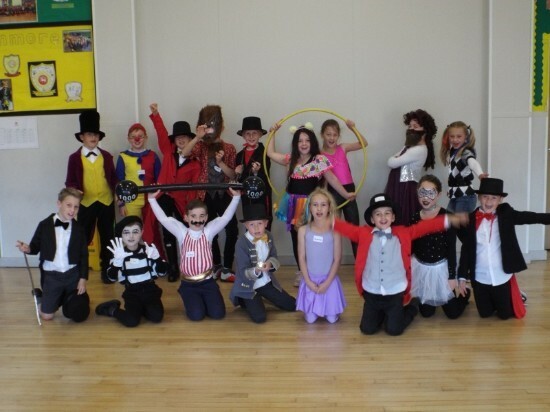 The children devised and performed their own circus shows, wrote clown character descriptions and circus inspired poetry using expanded noun phrases and shared circus stories in the Library. Our celebration of the circus ended this morning with an inter-House circus quiz on the playground during break-time. With a healthy competitive spirit on show, the jury remains out on whether Headley, Norbury, Ranmore or Wisley will scoop the most house points for returning the highest number of completed entries.